Unnakoti is a unique place, which can not be compared to any other place in the country in terms of absolute grandeur and artistry. 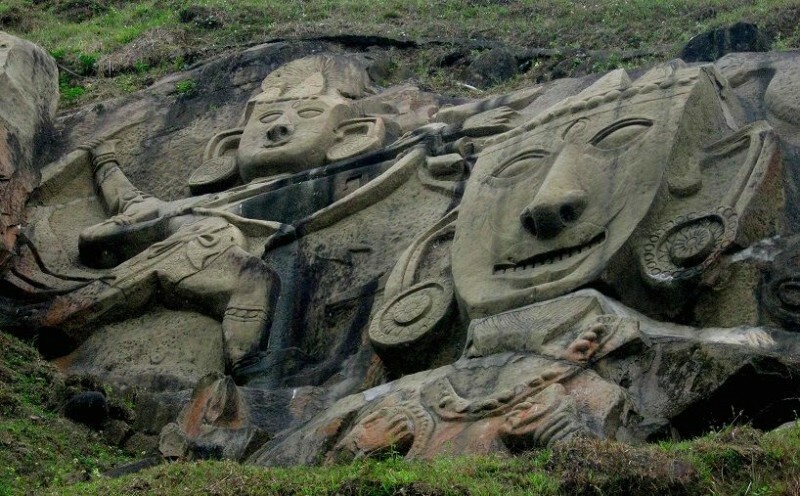 Located about 178 km from Agartala, capital of Tripura, this site consists of several huge vertical rock-cut carvings on a hill side. Huge sculptures were chiseled out from the rock-sides and the images were carved. The site is situated between the lush green forests and mountains. The beauty of the carvings and the ethnicity of the sculptures have been enhanced by the greenery surrounding it and protecting it throughout the ages. 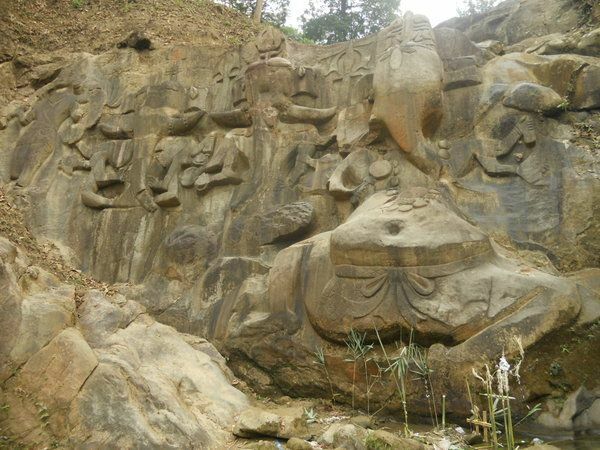 Unakoti has the largest rock-cut images and stone idols of Lord Shiva in India. Who created such marvelous rock carvings and the stone images of gods and Goddesses in such a deep forest hundred years ago is indeed a mystery. Why this secluded hilly place was selected for the purpose is not known. Archaeologists are still working on this place to find more about its history. According to some archaeologists these idols were sculpted by master sculptors elsewhere and were brought in Unakoti with great care. It is assumed that the site dates back to the period between the 7th – 9th Centuries A.D, and that the sculptures belong to two different periods of art. The word ‘Unakoti‘ means “one less than a Crore”. Folklore has a fascinating tale to portray on Unakoti. It says that once upon a time about one crore God and Goddess were going on a journey to Kaashi in Varanasi. On their way during twilight, they all rested on this spot. Lord Shiva, however, cautioned them that all must leave the place before the crack of the dawn, otherwise, all would transform into a stone. At dawn, Lord Shiva woke up in time and left the place while all other gods and goddesses turned in stone images as they were fast asleep. Since then this place was named as Unnokoti. On the hilly terrain many idols of gods and goddess are lying scattered. The images found at Unakoti are of two types namely rock-carved figures and stone images. Among the carved-out images on the rocky fringes those of Ganesha and Shiva are prominent. The central Shiva head known as Unakotiswara Kal Bhairava is about 30 feet high including an embroidered head-dress which itself is 10 feet high. On each side of the head-dress of the central Shiva, there are two full size female figures – one of Goddess Durga standing on a lion and the other one is believed to be that of Goddess Ganga. A huge Lord Ganesha figure is carved in the Unakoti complex, while there is also a chaturmukha Shivlinga nearby. In addition three enormous images of Nandi Bull are found half buried in the ground. Among other rock-cut and stone images are those of Vishnu, Narasimha, Ravana, Hanuman, and several unidentified deities. The place also shows strong evidence of Buddhist occupation. In 16th century A.D, Kalapahad – a Muslim general of Mughal governor of Bengal – caused huge destruction to the site. He destroyed Bhubaneswar Shiva and Tungeswar Shiva stationed nearby. Later gradual change in nature too had adverse impact on spectacular art work of human race. Every year a big fair popularly known as ‘Ashokastami Mela’ is held in the month of April which is visited by thousands of devotees. The stone carvings in Unakoti are one of the most detailed ones in India and yet, this place is rarely visited. According to an assessment made by Archaeological Survey of India (ASI), some statues were still undiscovered in the jungles which needed to be preserved, while many were taken away by local people for worship at home. This place is worth to be tagged as a world heritage site. I love India! It's so mysterious. every part of it and I have you book-marked to check out new things in your web site. Awesome! Its genuinely awesome post, I have got much clear idea concerning from this paragraph.